A number of articles discuss raising the temperature of data center spaces in order to save cost. In many situations, very significant cost savings can be had by doing this – but raising the temperature is only a part of the picture. The act of raising temperature in any space means that the space simply has an overall increase of the enthalpy or total energy. This act by itself does nothing for the thermodynamics of the system. 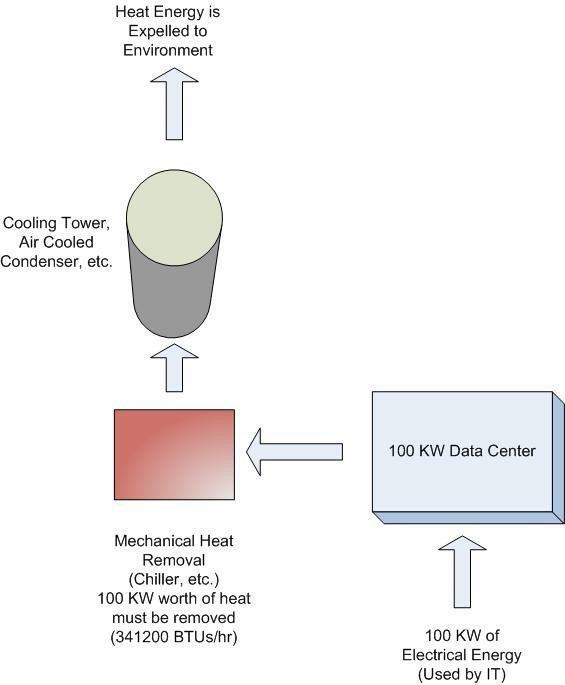 From a data-center-space perspective, regardless of the temperature, the heat energy generated by the servers and equipment must be transported or expelled from the area. It is in this process that you can either make the system efficient or not. This is the power to remove that heat with the chiller; but we also have cooling towers, pumps, and other equipment to consider. For most systems, you can add an additional 25 percent of the chiller load for the supporting-equipment load. In this case, that would be 5.7 KW, for a total of 22.7 KW. So the bottom line is that to run a data center of 100 KW, we need to pay for an additional 23KW of cooling. What this means is that, for a 5- to 6-MW data center, we would typically see about 1 to 1.2 MW of that total load just for cooling. This can sometimes translate to $50- to $60,000 per month just to move heat out of the building. So how does this all play with raising data center temperature? For now, the best solution is normally a combination of both natural (economization, etc.) 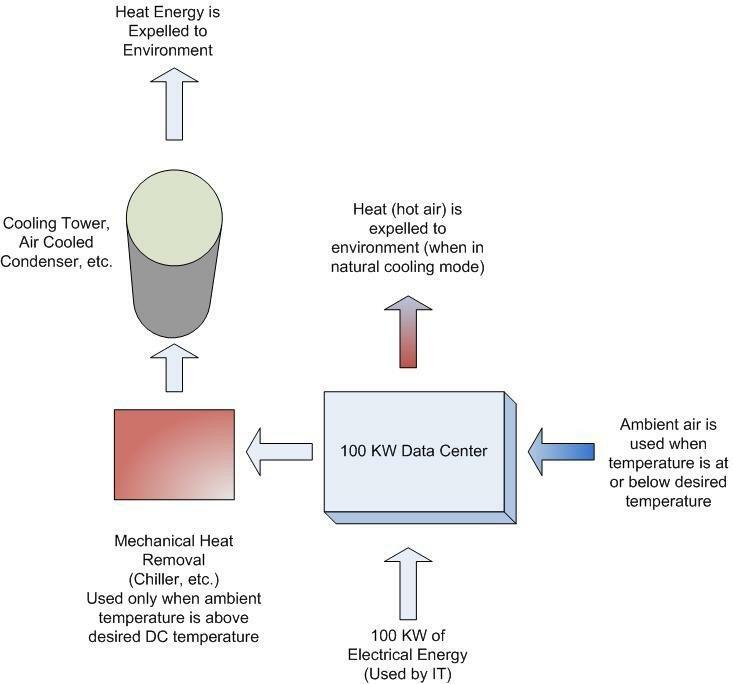 and mechanical processes; but for this to work and take advantage of the environmental cooling available, the acceptable temperature of the data center should be set to maximize effectiveness (maximize cost savings). 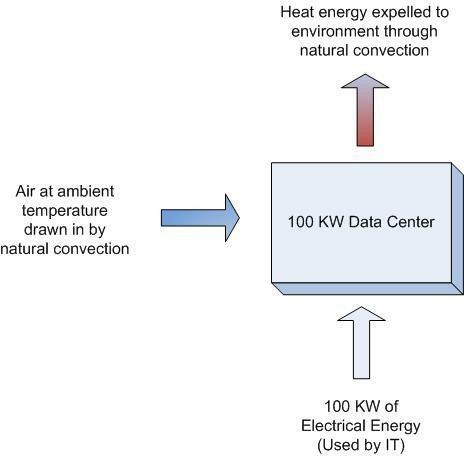 In this scenario (data center with economization), the temperature we desire to maintain at the data center directly affects how much we can use outside air for cooling. In a location like Phoenix, if our data center supply air temperature is set at 62F, we can use outside air to cool the data center for approximately 3 months of the year. If we set the temperature to 72F, this increases to approximately 6.5 months of the year. This change represents a potential cost savings of $120,000 to $160,000 a year. Average outside air temperatures plays an important role in data center costs, and so it pays to find a location that allows you to utilize the outside air for cooling. (This explains why the northern latitudes are sought-after data-center locations.) Many areas in the northern United States can support almost 8,000 hours a year in free cooling with a data center supply air temperature of 72F. So simply raising the temperature of the data center will not give you the large reduction in costs. Couple free cooling (economization) with raising data center temperatures and you should see significant savings. This recommendation makes a lot of practical sense…who turns on the A/C at home when it’s nice outside?